Iowa Legal Aid Disaster Legal Assistance Mobile App Available in the iTunes and Google Play Stores. It is important to plan ahead for disasters. The more you prepare ahead for a disaster, the faster and easier it may be to recover. If you are experiencing the effects of a disaster, you may face many different legal problems. 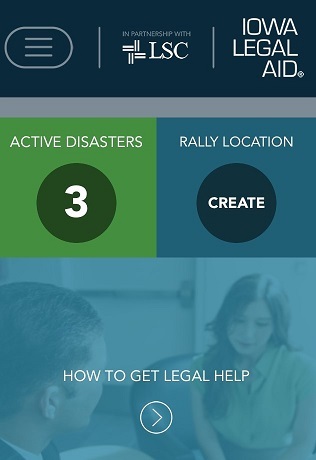 The Iowa Legal Aid Disaster Legal Assistance Mobile app is designed to help people by providing tools to prepare in advance for a disaster and for people who are experiencing the effects of a disaster. A preparation kit checklist that suggests important items you should have ready to go at a moment's notice. The checklist allows you to check off each item so that you can keep track of what is ready to go. who you should contact to notify where you are and whether you are OK.
A rally location feature that provides GPS navigation to a meeting spot selected by the user. A code is then generated that can be shared with other users of the app. If the other users enter that code into their own rally location feature, they will receive GPS navigation to the same meeting spot. The tool could be particularly helpful in the event a family is separated when a disaster hits. An insurance records area where you can upload important insurance information so that you will have it when you need it. real-time weather alerts through a news feed in the app. receive push notifications (similar to text messages) with vital information. Articles and information on disaster recovery and your legal rights. Links to other websites that contain helpful disaster relief information. You can also find and contact many different disaster relief and human services agencies using the app. If you're involved in disaster response, you can use the app to refer a survivor to Iowa Legal Aid using the disaster responder referral form. Using this app, you will be better prepared if a disaster affects you. Share this information with your friends and family so more Iowans can be better prepared when the need arises. * This App was developed with funds provided by a Legal Services Corporation Midwest Legal Disaster Coordination Grant and the Greater Cedar Rapids Community Foundation.